January 2017 | Oh Sarah O ! If you haven't seen the latest music videos from electronic music artist, Grimes, I strongly urge you to do so. Not only is the music entrancing, but the videos are quite visually stunning. Check out the video for the song "Butterfly" above. When The Weekend's "Starboy" song first came out, my husband would play this song on repeat several times a day, so now everytime I hear it, it reminds me of him. 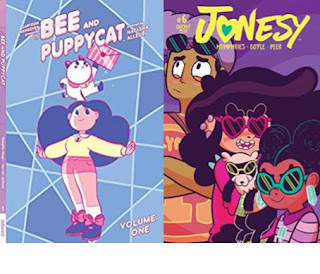 Jonesy #2-7 ; Bee and Puppycat #1-7 by Natasha Allergri This fall I continued to read comic books with a girl power slant. Bee and Puppycat follows Bee- an unemployed girl who adopts a magical creature called Puppycat and together they complete tasks for a magical temp agency. It's very fun to read, and one issue is interactive- containing hyperlinks so you can listen along with the quest. You can see my write up for Jonesy in my previous post. The Girls by Emma Cline If you're familiar with Charles Manson, you'll recognize elements in this book. Nevertheless, this book is gripping and haunting. Luckiest Girl Alive by Jessica Noll This book reads like a less-well-written version of Gone Girl. This author is an editor from Cosmo and SELF magazines and it shows. All of the characters were over-privileged and very unlikable. NEXT! The Crystal Cup by Bram Stoker I was already familiar with Bram Stoker's Dracula, so I chose to read this short story for Halloween. Stoker's ghost story is heavily influenced by Edgar Allan Poe in a good way. The Assasination of Margaret Thatcher by Hillary Mantel If you approach this book expecting it to be like Mantel's historical fiction series, Wolf Hall, you might be disappointed. This is a collection of short stories with more similarities to the television series, Black Mirror, than her historical fiction. This was a fine read during the Halloween season! We Have Always Lived in the Castle by Shirley Jackson Apparently I was really into ghost stories this fall, because this is another mystery/ suspense/ gothic horror/ ghost story. I loved this book and hope to check out more books by the author. Half the Sky: Turning Oppression into Opportunity for Women Worldwide by Nicholas D. Kristoff This book was chosen by the Our Shared Shelf Book Club. I have found that when I'm feeling stressed in my day-to-day, that I have a hard time watching shows, movies and reading books with difficult subject matters which played a factor here. Do you know those ASPCA PSA advertisements- the ones where Sarah McLachlan's Arms of the Angel song plays in the background (see here)? It kind of reminded me of that. At first I tried to read a paper copy of the book, but after reading a few chapters I could go no further so I put it down. About a month later, I tried again, pacing myself with audiobook version and got to the end. In conclusion, I'm glad I read it- I feel like I'm more aware of the struggles for women worldwide and I learned about a few new non-profits that I can support to do my part to support women worldwide. 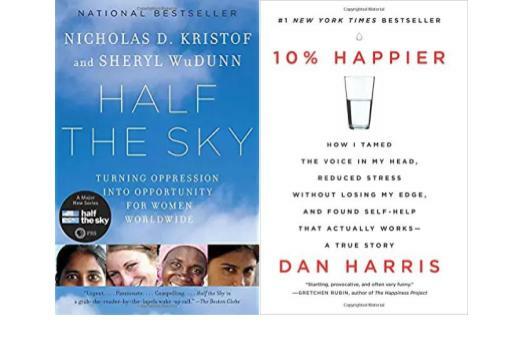 10% Happier: How I Tamed the Voice in my Head, Reduced Stress Without Loosing My Edge, and Found Self-Help that Actually Works-A True Story by Dan Harris This wasn't your typical self-help book. I liked the author's relaxed, non-preachy style which focused mainly on the author's own experiences with a sense of humor too. Thumbs up! It's hard to believe that David Bowie left this world about a year ago. This week, I'm remember David Bowie by listening to one of his last songs, "Lazarus." I know that a lot of folks are happy to see 2016 go and I feel your pain! Personally it was a bittersweet year for me. It was the year I left the UK and returned to The States, I got to see friends and family that I hadn't seen in over 3 years, and it was the year I finally scored a job doing the thing I went to graduate school to do. That being said- with the move and starting a new job I had to let a few things go: I didn't travel as frequently this year, but I've enjoyed exploring my new city; I didn't blog as frequently as in previous years; I didn't sew anything; and while I walk quite a bit more than I used too, I haven't really made a huge effort to exercise. I'm not going to promise that I'm going to get any better about these things, but I haven't forgotten about them. In 2015 I sat out to read 15 books and ended up reading 47, so this year I aimed to top myself and read at least 50 books and ended up reading 69 books (including comic books and graphic novels); and while I didn't end up completing all of the 2016 Reading Challenge, I was able to keep up with Emma Watson's My Book Shelf Feminist Book Club. I hope to read at least 50 books in 2017 as well. In 2016 I kept up with drawing and painting. 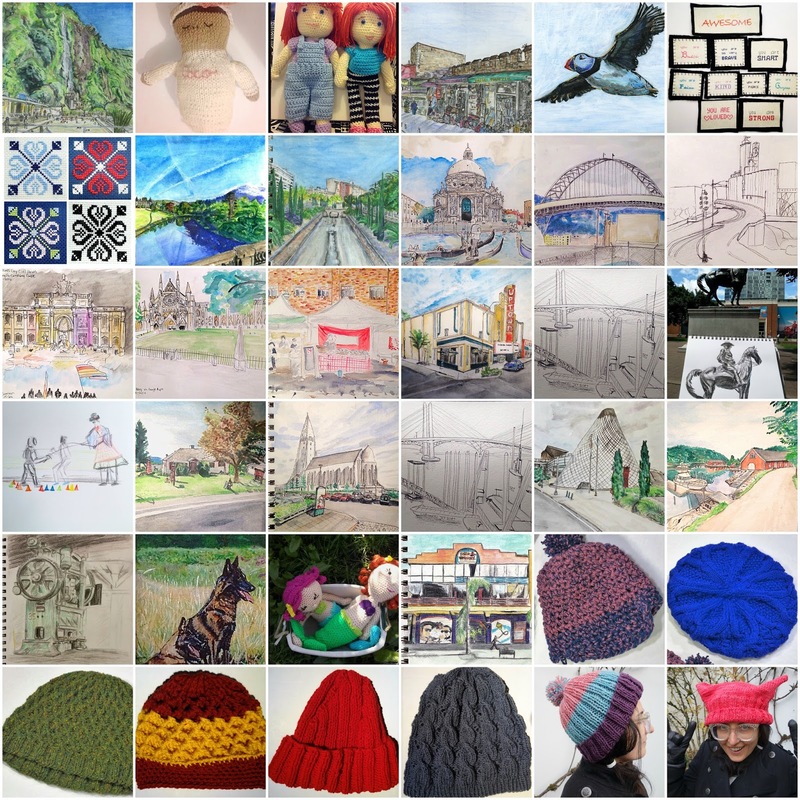 I continued to explore the world through The Virtual Paintout, and I met up with my new local Urban Sketchers group and a few other sketching groups. I also completed a few paintings, I knit and crocheted hats and toys for friends, family members, and work, and I crafted for several causes such as the YASVB project, Stitch for Syria, hats for Standing Rock, and the Pussyhat Project. Make at least one out-of-state trip.